Haas skipped all the silly teasers other teams have been doing and surprise-revealed their entire new VF-18 Formula One car for 2018 this morning. It’s the first F1 car unveiled of 2018 with the newly mandated halo to better protect a driver’s head and upper body in the car. It looks shockingly okay. The halo is the head protection device built over the driver’s cockpit on the car that looks sort of like the top of a flip flop. Haas blended their halo into the rest of their car pretty well, opting to make it black like the black structures around the cockpit. As for the rest of the car, the VF-18 is an evolution of last year’s VF-17, so hopefully this continues the trend of America’s only F1 team improving with each year. The team focused on improving the weak points of last year’s car to improve the car’s reliability and speed, per the team’s announcement. They also added the halo and reduced the size of the sharkfin over the engine cover. Most of the F1 regulations regarding the cars carried over from last year, so I expect a lot of this year’s F1 cars will be small improvements on the 2017 ones. The biggest part of the car’s evolution was the addition of the halo. It took quite a bit of study by the aerodynamicists, but the designers had to work hard to modify the chassis so the halo could survive the mandated loads. The total minimum weight of the car increased because of the halo, and there’s a higher center of gravity simply because of the halo’s position. But, everyone is in the same boat. Per the new rules, the halo must withstand forces equivalent of having a double-decker bus sat on top of it, according to Mercedes’ technical director James Allison, speaking in a team video on the matter. Integrating this strong piece is by far the biggest design challenge of the year for teams. 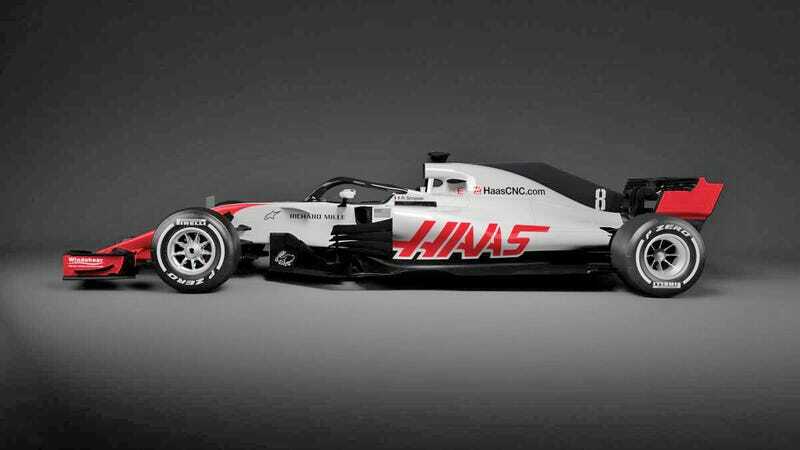 The car’s name is a callback to the CNC machines that gave team namesake/primary sponsor Haas Automation enough money to dabble in F1 in the first place, per the annoucement. Haas’ first CNC machine was called the “VF-1,” for “very first one,” so the “VF” naming structure stuck. This will be Haas’ third year in F1 after scoring 47 manufacturers’ points last season, good for an eighth place finish ahead of two longtime F1 teams. Romain Grosjean and Kevin Magnussen will return as the team’s drivers.